ZIMBABWEAN President Robert Mugabe received a standing ovation at the funeral of former South African President Nelson Mandela while the country's president Jacob Zuma was booed. There were raptures after his presence was acknowledged at the FNB Stadium in Soweto by the country ANC deputy president Cyril Ramaphosa. 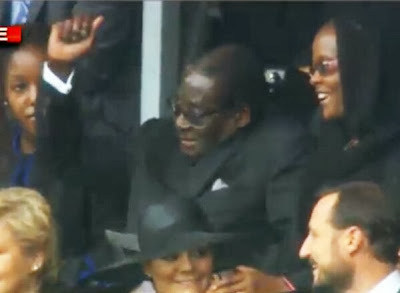 Mugabe waved back to the thousands of mourners at the giant stadium which accommodates a capacity 90 000 crowd. 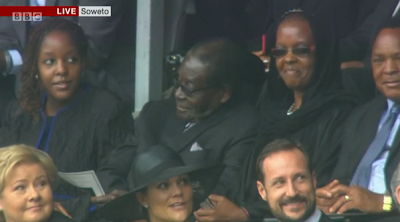 Mugabe was seated next to his wife Grace and children when other African heads of state clapped and stood in appreciation of his presence. Goodluck Jonathan, the Nigeria President, and Joseph Kabila of the Democratic Republic of Congo, are two other heads of state that drew ovations, nonetheless lesser than Mugabe. Several international media houses were ahead of the event portraying Mugabe as unpopular in South Africa. International media compared Mugabe and Mandela, a development which was roundly condemned by Zimbabwe, and other African countries. In Zimbabwean, the country's Minister of Information, Media and Broadcasting Services, Jonathan Moyo, dismissed the comparisons as "frivolous attempts by the Western media". “It is kind of disappointing that Nelson Mandela's passing on has attracted gratuitous comparisons between him and other African leaders including our own President Mugabe whose iconic standing as a liberator and empowerer is now an indelible imprint of history. “The notion being peddled in some propaganda quarters that some African leaders should style themselves as Mandela clones has no precedence in the history of civilised nations," Moyo was quoted as saying. Mandela died last Thursday at the age of 95. He will be buried on Sunday.